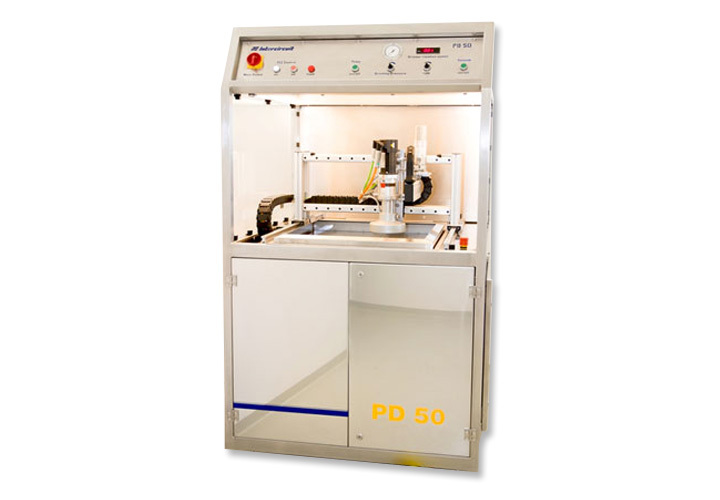 The design principle of this new machine is based on many years of experience with our PD30 which has been successfully used in many companies. The extension to wet grinding is based on the thermal requirements of particularly thin printed circuit boards and very sensitive base materials. Great emphasis is placed on accurate as possible grinding results. Furthermore, the dust exposure to the operators will be reduced to an absolute minimum. During the manufacturing process, certain types of circuit boards will require the plated through holes to be filled with an epoxy material. This material may be conductive or Non-Conductive. After the plating and filling operation, the epoxy filled holes are then sanded or planarized back to the level of the original or substrate copper. The panels where Non-Conductive hole fill material is used are then metalized and copper electroplated over the hole fill area to provide a perfectly flat surface. This process allows the area of the hole to be used as a pad. This machine grinds copper and surplus hole filler from PCBs and inner layers. The panels are secured tightly to the granite table by a vacuum. This enables the panels to be secure and not move while the machine is in operation. Also, twisted and warped boards are aligned straight, with the use of the vacuum table. The grinding device moves uniformly over the board, which makes the surface smooth and even. Acrylic glass walls protect the working area on three sides. Only the operation side is open. The speed of the grinding wheel is servo controlled. The grinding pressure to the board can also be adjusted. 20 µm (white), 40 µm (yellow) and 74 µm (red) manufactured and distributed by ITC. The vacuum working table size is 650 mm * 650 mm (25 1/2 " * 25 1/2") and consists of a particular granite stone "Nero Impala". The vacuum table is precision ground flat, polished and contains small holes for the vacuum and the outflow of the cooling water. The framework and the cover including the control cabinet are made of stainless steel. Use of the guided movement, the exact grinding setting and the PLC controlled grinding pressure, avoids damage to the copper surface. The actual grinding pressure is displayed on the control panel. The water is fed through the center of the brush. The cooling water is circulated through a filter. The water storage tank has a maximum capacity of 45 liters (about 12 gallons) cooling water. The tank is easily removed for cleaning purposes. The cooling water supply starts automatically with the lowering of the grinding brush and automatically stops when the grinding process is interrupted.